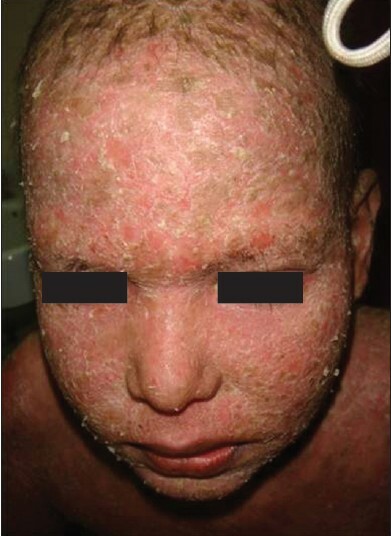 Pemphigus foliaceus is a rare autoimmune blistering disorder characterised histopathologically by subcorneal blisters and immunopathologically by IgG antibodies to desmoglein 1 (dsg-1). It responds well to systemic corticosteroids. 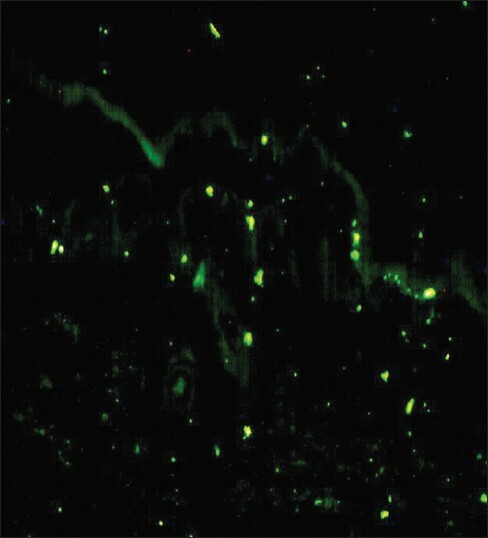 Immunoglobulin A (IgA) pemphigus is relatively a newly described intraepidermal blistering disorder characterised by IgA autoantibodies directed against desmosomal components, mainly desmocollin. It responds well to dapsone but poorly to steroids. , We report here an interesting case of histopathologically and immunopathologically proved Pemphigus foliaceus, clinically masquerading as IgA pemphigus responding poorly to systemic corticosteroids and responding well to dapsone. 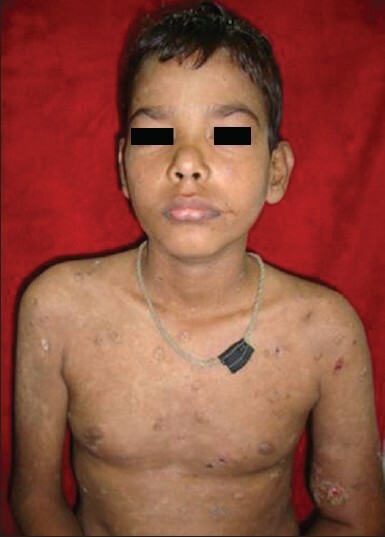 A 14-year-old male child presented with complaints of recurrent episodes of multiple, fluid filled lesions over trunk and scalp, since seven years. These lesions used to rupture spontaneously, leaving behind painful, burning erosions. Birth and developmental history was normal. No history of oral or genital ulceration, any drug intake prior to onset, photoexacerbation, koebnerisation or similar illness in family members was present. 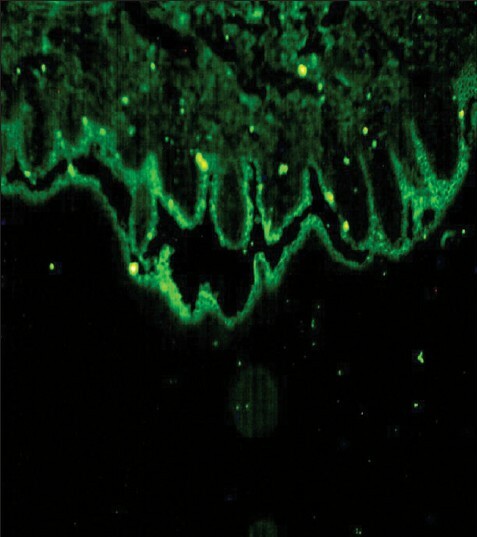 Dermatological examination revealed crusted plaques and erosions in a seborrheic distribution [Figure 1] and [Figure 2]. There was no mucosal involvement. Nikolsky's sign was positive. Prior to present consultation, he had taken prednisolone 40 mg tablet, once a day along with supportive therapy with which he had only partial relief. He was also prescribed azathioprine 50 mg tablet once a day which was stopped after 10 weeks as he did not respond. In view of above clinical picture, patient was evaluated with a clinical diagnosis of pemphigus foliaceus, and histopathology and direct immunofluorescence (DIF) confirmed the same. He was treated with dexamethasone pulse therapy. But after the second pulse, patient developed a relapse. He had also developed osteoporosis with impending spinal compression fracture with Cushingoid features [Figure 3]. 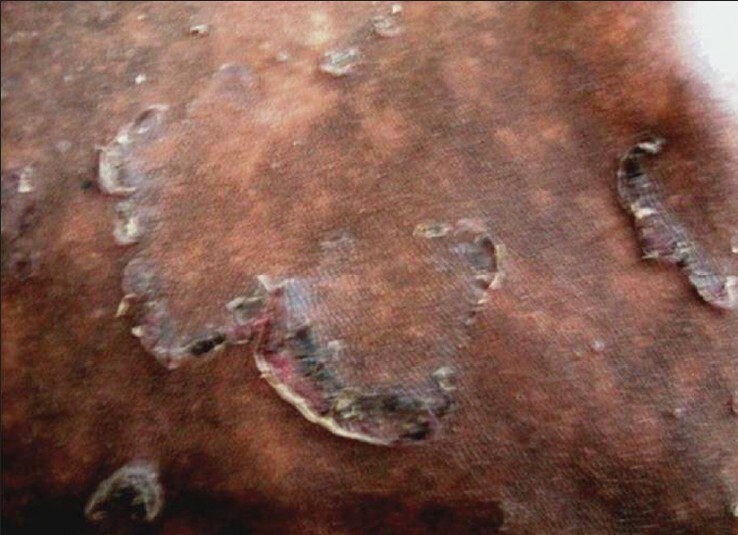 Dermatological examination at the time of relapse revealed circinate pattern of lesions predominantly involving trunk and flexures [Figure 4]. Nikolsky's sign was negative. Oral mucosa and genitalia were normal. On the basis of these clinical findings, a diagnosis of IgA pemphigus was considered. Repeat biopsy, samples for DIF and ELISA for desmoglein antibodies were sent. 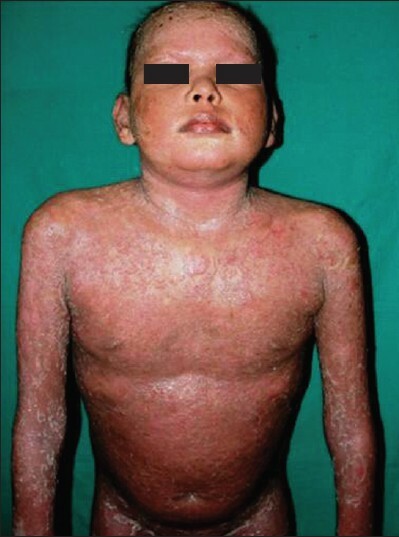 Meanwhile, systemic steroids were stopped and he was started on Dapsone 100 mg tablet, daily. He responded dramatically within four weeks [Figure 5]. Repeat histopathology of lesional skin was consistent with pemphigus foliaceus revealing acantholysis in upper epidermis, complete loss of stratum corneum and subcorneal cleft filled with neutrophils [Figure 6]. Repeat DIF showed strong positivity for IgG, but was negative for IgA [Figure 7] and [Figure 8]. ELISA for anti dsg-1 antibodies was strongly positive with a titre of 215.5 units/ml (normal range <20 units/ml). Pemphigus foliaceus is clinically characterised by flaccid bullae with associated scaling and crusting. Seborrheic areas are initially involved, but it may later generalise. Both pemphigus foliaceus and IgA pemphigus are common in the middle age group, though they may occur in childhood also. Mucosal involvement is rare in both, as was in our patient. The evolving lesions of pruritic flaccid vesicles forming circinate crusted plaques, absence of Nikolsky's sign, site of predilection being axillae and groin were all suggestive of IgA pemphigus. Pemphigus foliaceus is generally regarded as a benign disease, which responds well to topical or oral steroids and to azathioprine or cyclophosphamide in severe cases. Dapsone has only been used as an adjuvant in few patients, especially those with pemphigus herpetiformis like lesions. Unlike IgG pemphigus, IgA pemphigus is often not controlled with corticosteroids alone. Sulphones appear to be effective as a single agent or in combination with other drugs. This case had clinical features of IgA pemphigus but repeated histological and DIF features were confirmatory of pemphigus foliaceus. It is therefore a rare instance of a DIF proven pemphigus foliaceus in a child, resembling IgA pemphigus, both clinically and therapeutically. 1. Kowalewski C, Hashimoto T, Amagai M, Jablonska S, Mackiewicz W, Wozniak K. IgA/IgG pemphigus: A new atypical subset of pemphigus? Acta Derm Venereol 2006;86:357-8. 2. Basset N, Guillot B, Michel B, Meynadier J, Guilhou JJ. Dapsone as initial treatment in superficial pemphigus: Report of nine cases. Arch Dermatol 1987;123:783-5. 3. 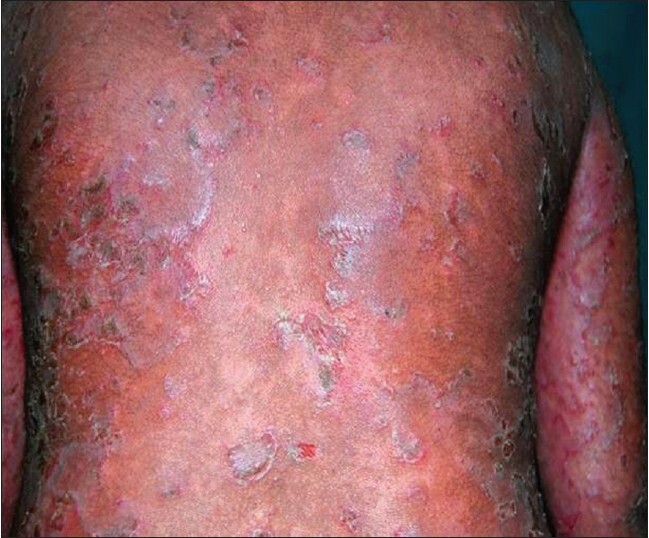 Maciejowska E, Jablonska S, Chorzelski T. Is pemphigus herpetiformis an entity? Int J Dermatol 1987;26:571-7. 4. Yasuda H, Kobayashi H, Hashimoto T, Itoh K, Yamane M, Nakamura J. Subcorneal pustular dermatosis type of IgA pemphigus: Demonstration of autoantibodies to desmocollin-1 and clinical review. Br J Dermatol 2000;143:144-8. 5. Hodak E, David M, Ingber A, Rotem A, Hazaz B, Shamai- Lubovitz O, et al. The clinical and histopathological spectrum of IgA-pemphigus-report of two cases. Clin Exp Dermatol 1990;15:433-7. 6. Hashimoto T, Kiyokawa C, Mori O, Miyasato M, Chidgey MA, Garrod DR, et al. Human desmocollin 1 (Dsc1) is an autoantigen for the subcorneal pustular dermatosis type of IgA pemphigus. J Invest Dermatol 1997;109:127-31. 7. Kárpáti S, Amagai M, Liu WL, Dmochowski M, Hashimoto T, Horváth A. Identification of desmoglein 1 as autoantigen in a patient with intraepidermal neutrophilic IgA dermatosis type of IgA pemphigus. Exp Dermatol 2000;9:224-8. 8. Beutner EH, Chorzelski TP, Wilson RM, Kumar V, Michel B, Helm F, et al. 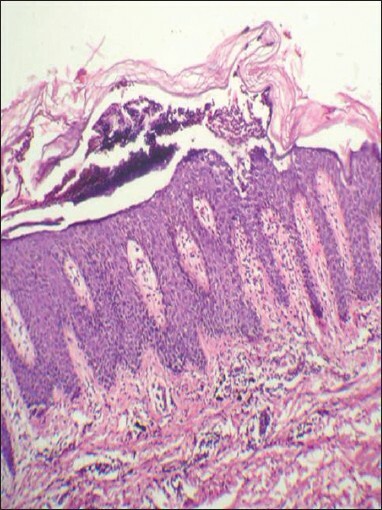 IgA pemphigus foliaceus. Report of two cases and a review of the literature. J Am Acad Dermatol 1989;20:89-97. 9. Bruckner AL, Fitzpatrick JE, Hashimoto T, Weston WL, Morelli JG. Atypical IgA/IgG pemphigus involving the skin, oral mucosa, and colon in a child: A novel variant of IgA pemphigus? Pediatr Dermatol 2005;22:321-7. 10. Gautam RK, Jain RK, Kar HK, Yadav TP, Bhardwaj M. Dapsone responsive juvenile pemphigus foliaceus. Indian J Dermatol Venereol Leprol 1994;60:294-5.